Sitting in our darkroom at Tropicana Field editing the championship game of the Final Four my mind couldn't help but think what UConn's upset of Duke really meant. That in six short days, some of us in St. Petersburg would be back in Augusta for another go at covering the year's toughest sports assignment, The Masters. For some off us, the madness is not in March but in April. 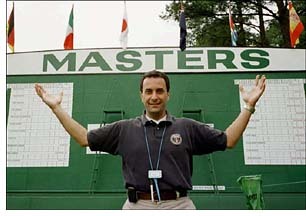 This year I will celebrate my 10th anniversary of covering the Masters. Like every year since 1990 when Nick Faldo won the tournament in a playoff, I have sworn I will never return to that golf tournament but as time inches closer to it, I always truly look forward to my week in Augusta. It truly is like no other week of the year spent covering sports. course, we try and have dinner with the AFP crew every year, we try and host a barbecue for the Reuters crew each year, we tend to eat in the same restaurants on the same nights each year and like I said earlier, we walk off the course on Sunday evening vowing never to return but always do. rounds before the tournament begins. I am always amazed at how many pictures get published around the world from practice rounds on Monday and Tuesday. By Thursday when the tournament begins you are already dead from walking the course. I compare it to trying to climb Mount Everest. By the time you get to the toughest part of the climb, going up the Hillary Step to the summit, you are in your most physically worst shape. If only one could show up Wednesday night and hit the course Thursday morning rested and ready, life would be beautiful. Practices days at the tournament are hell, period. There are twice as many people on the course as there are during the tournament and they are almost all out-of-towners, meaning "Yankee Bastards" as more than one southern person who attends just the tournament rounds has referred to those, practice folks, as. Most people who have tickets to the tournament would not get caught dead on the course during practice rounds. The true hell at the Masters is that photographers are not allowed inside the ropes at anytime, ever. Nor is anyone else for that matter except the golfers and their caddies. This creates a beauty unlike anywhere else in golf as no TV cameras follow the golfers up fairways, no sign card holders clutter backgrounds and no security or police officers walk with the golfers. The beauty of The Masters is it is a true celebration of the sport and it is not cheapened in anyway nor commercialized at all. There just simply are no advertisements anywhere to be found. Just lush green grass and backgrounds of beautiful azaleas and dogwoods, that is if they do not bloom to early. I am told this year they came out very early and should all be gone by the start of the tournament. Now that is music to my ears since years when there are no flowers in bloom, life is a bit easier since all the cliche "beauty pictures" to be made don't have to be done. I can easily do without taking "Azalea Picture Number 123" on Wednesday this year. A photographer's life at The Masters is completely dependent on the crowd since we have to work standing next to them to get our pictures. This is what makes the practice rounds difficult. During the tournament the gallery is very used to our being in with them. Tickets to The Masters are the toughest to get in sports and the people that go have been going for a very long time. I always make an effort to talk to people and ask them how many tournaments they have attended as I sit beside them waiting for a golfer to approach and it is amazing to hear people say 45 years, 39 years, 32 years, etc. etc. etc. They know our life is difficult and it is not unusual for them to part the ways to let us get a view of a green. They know full well that we get our photo then more times than not, immediately leave. However during practice rounds most of the people are first timers who have been fortunate enough to get tickets through a lottery based system and they could care less about what we have to do. And as difficult and rude as they are to us and as much as you just simply want to scream at them you can't. One simple complaint about your behavior and the tournament committee will pull your pass in a heartbeat and never ask you back. Hmmmmmm, so that is how you keep from going back? I always think but of course never act it out. You must realize getting a photo credential to The Masters is more about getting a personal invitation to witness the tournament rather than going there to work it. I actually think there is something nice about that. In the years before Tiger Woods won, life was different in planning how you covered the tournament. The gallery was not that big in walking with the golfers. It has always been common for spectators to plant themselves at one hole and sit there all day while every golfer goes past, then go home. These days with Tiger however, I have noticed a large part of the gallery that likes to follow him around the course. It makes covering him tough but eases the crowds on other golfers. Last year we had what I would consider the second possible ultimate in nightmares on the final day when Tiger and Jack Nicklaus were in consecutive groups. The size of the two galleries following them was unbelievable especially since Jack was almost in the lead. There were areas of the course that were virtually impossible to pass as the galleries collided together. The only thing worse would be for Jack and Tiger to play in the same twosome on the final day or any day for that matter. As hard as it is to cover the tournament it is made significantly easier by the layout of the course. Unlike most courses where there is a distinct front nine and back nine, at Augusta National you find the holes fold in on themselves and you end up with things like a fairway from the front nine running beside a fairway from the back nine or groupings of greens in small areas like numbers 4, 6 and 16 being near each other or greens 2, 7, 10, 14 and 17 being side by side. With only two Reuters photographers on the course, finding a golfer who jumps unexpectedly into the lead may not always be that difficult. The Masters unquestionably provides those photographers who cover it with some of their most wonderful moments of the year and also their worst. I believe all golf pictures look better when taken at the Augusta National Golf Club. 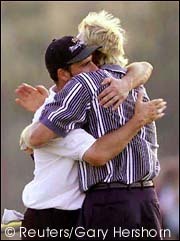 The emotions that run through the golfers minds are unequaled in any other tournament during the year so when they react they do give you pictures, that is if you don't have a spectator stand up in front of you. Just as the golfers look at the tournament as being something special so do the fans. All the greens have an area where the gallery sits and then there is the standing room behind them. It is common for us to get to the front of the standing area but not the seated area. I wish I had a nickel for every picture I have missed because one person stood up when a magnificent birdie was made or a ball just rimmed out of the cup. Fans react right along with the golfers and there is nothing you can do except hope no one stands up and never let a missed picture bring you down. Everything about who gets the best picture is so dependent on luck. You virtually never are in the exact place you want to be unlike when you cover other tournaments and perfectly position yourself in front of the golfer almost every time for almost every putt. How many times have we all made mad dashes around the green when a leader has over shot the hole on a putt and we find ourselves all the sudden behind them. 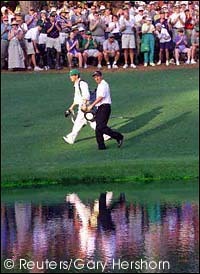 At Augusta you stay behind them because there simply is no way to make it through the crowd and into a new position. You just pray a lot that they don't react when you are in those bad positions. But of course they always do. Ten years of covering The Masters has left me with an amazing array of memories that I would not trade for anything. Tiger Woods victory ranks among the top three things I have witnessed in the world of sports and I hope I have a long career still of covering that tournament. I just hope some day that it moves to being the editor from being the photographer.